I am a big fan of Apple Music, but Spotify is also really fantastic. One of the aspects of Spotify that I do miss on Apple Music is the wealth of homemade playlists. Spotify is the defacto place for most people to share playlists because Spotify doesn’t require a paid plan in order to listen to them. 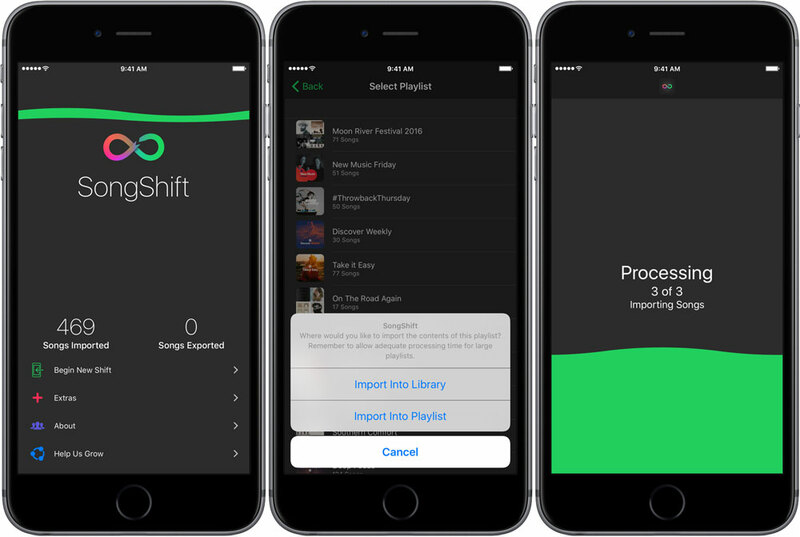 SongShift is a neat app that helps bridge the gap between Spotify’s playlists and Apple Music’s integrated library. Once you open the app (requires the $4.99 Pro upgrade for playlists larger than 100 songs), tap Begin New Shift. Next, select Spotify as the source (you’ll be prompted to login to your Spotify account). Then, select the playlist you want to import. Choose Import Playlist, and then you will have the option of either adding it to a current playlist in Apple Music or creating a new one. One thing I would recommend is to disable adding playlist songs to your Apple Music library. You find this option under Settings > Music. This will keep your main library free of a lot of one-song albums.